Compassion is something we all need for healing. But when the storms of life come, we often find ourselves feeling alone, and it may be difficult to see that the rest of the world is hurting for us. But God cares for the hurting and the lonely, and He inspires us to reach out and help as many as we can. On a chilly January day, with the brutal Atlantic winds pushing the temperatures into minus territory, a Samaritan’s Purse team was at a house to pull up floor boards and remove sheetrock made moldy by floodwaters from Hurricane Sandy. But they were there for more than that. They were there to listen to the homeowners’ story and see how they might make a difference in their lives. We often make plans for the day, and God seems to show Himself most when our plans aren’t working out as we intended. That’s what happened on this day for Dave and Jack, two volunteers who drove to New York from North Carolina to help the recovery efforts from Hurricane Sandy’s aftermath. Dave and Jack are both military veterans. They came to Long Island representing their local church as part of a United Methodist mission team and were eager to get to work. The day started with the two men being reassigned to a new team that needed extra help, and they gladly accepted. As soon as they started working at the job site and getting to know the homeowners, Dave noticed a military memorial on a shelf. There was a Kevlar helmet next to a folded flag, and pictures of a man in military fatigues with an ammunition belt slung around his neck. They quickly got to work on the house to try and make a difference, but something began to eat away at Dave. 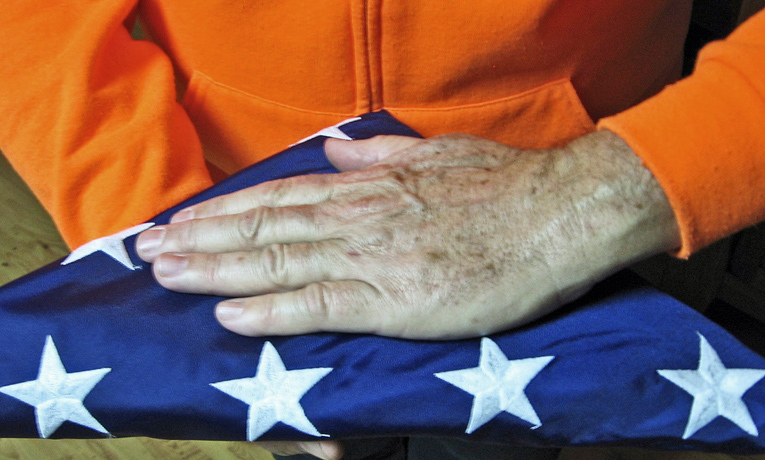 The flag was not folded properly, and so to him the memorial was not complete. 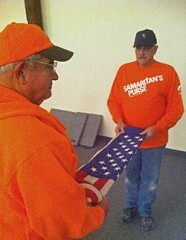 He went to his team leader, Daniel Carl, and asked if it would be appropriate to refold the flag. Daniel sensed an opportunity and gave Dave the green light to approach Josh and Kamia, the homeowners, to ask if he could do just that. Josh opened up about the moving story of his best friend who died after serving two tours in Afghanistan. It clearly was still weighing heavy on his heart. The flag was Josh and Kamia’s personal flag that was flying at their home the day that their best friend was killed. Josh was honored that Jack offered to refold the flag. It is the little things that can touch the hearts of the hurting and begin the healing process. Pulling floorboards up and removing wet insulation is important work, and often provides the bridge that gives us the opportunity to share the Gospel. However, sometimes the more important task is praying with these grieving homeowners and just giving them a compassionate ear. Everyone stopped working to watch the impromptu memorial ceremony as Dave and Jack began carefully stretching out the flag and refolding it. When they had finished, they presented it back to Josh and Kamia and gave them the ceremonial slow salute, thanking them for their friend’s sacrifice. This simple spontaneous act of kindness had a big affect on these homeowners, and they kept talking about how meaningful it was to them throughout the day. As I heard the story later that evening, it reminded me of a Charles Spurgeon quote. He wrote, “Trouble is often the means whereby God delivers us.” As I thought about how many of the people here are experiencing more trouble than most of us may experience in a lifetime, I realized how important the little things are to them. A small act of kindness at just the right time, a compassionate ear to listen, and a helping hand in the name of Christ goes a long way in helping restore people’s hope and lets them know that God really cares.